Find out which Membership Level works best for you. NANOE Membership Specialist. Every NANOE Member is assigned their own personal Membership Specialist to ensure they have a productive and challenging NANOE experience. Best Practices. NANOE Executives, Fundraisers Consultants & Enterprise Partners are trained in and adhere to new guidelines that grow charitable enterprise. Capacity-Building Credentials. CNE, CDE & CNC credentials are for NANOE members only. Credentialing RenewalBig Value Automatic renewal of your CNE, CDE, CNC credential (no cumbersome or expensive re-certification processes.) Members who maintain their annual NANOE membership maintain their credential. Members Only Invitation to NANOE’s Annual Capacity Building Convention & Expo. Practitioner subscription to NANOE’s Capacity Builder Membership Library (digital downloads that contain thousands of pages of brand new best practice resources). Practitioner subscription to NANOE’s “Best Practice Magazine”. Recognition & promotion in NANOE’s Online Certification Directory. NANOE Voting Privileges. Every NANOE member is given one voting position in the NANOE Congress which convenes annually to codify best practices. TWO Complete Practitioner Membership Packages (all privileges - see below) for two designated representatives from your organization which may be transferred to another individual(s) should the member leave the nonprofit’s employ. NANOE Best Practice Charity MedallionBig Value Nonprofit organizations who maintain their annual-membership, keep their NANOE Link Profile up-to-date, commit to NANOE’s Best Practice Guidelines, and hold an IRS letter of determination for 501c3 status are named a NANOE Best Practice Charity. NANOE’s Charity ChamberBig Value Access to an online platform that connects you to one million 501c3 organizations state-by-state (only database in the world that includes complete contact information plus web addresses). Includes THREE Practitioner Membership Packages (all privileges) for three designated representatives from your business or corporation which may be transferred to another individual(s) should the member leave your employ. NANOE Capacity Builder Enterprise MedallionBig Value NANOE provides corporations and businesses who serve the charitable sector the designation NANOE CBE Partner. This “Seal of Approval” gives nonprofit administrators the confidence they require when choosing the cost-efficient and superior products they need to accomplish their mission. Enterprise Members who keep their NANOE Link Profile up-to-date, and commit to NANOE’s “Best Practice Guidelines” are licensed to use the NANOE CBE Partner Logo on their company’s website, stationery, marketing materials, etc. NANOE Convention & Expo Exhibitor PackagesBig Value VIP Discount Access to all NANOE events. PLUS special placement of your business or corporation in NANOE’s Year-Round Online Expo. NANOE’s three capacity-building training credentials are based on industry insider knowledge, university research, and a love for serving humanity. Each credential compliments the other ensuring CEOs, CFOs, COOs & CDOs are equipped with progressive capacity building practices that drive new growth. CNE, CDE and/or CNC credentialees have a history of employment as a professional member of a nonprofit organization staff, a professional consultant to nonprofit organizations, or has been employed in a field directly relating to service deliverables for the nonprofit sector. Striking the balance between managing volunteer board members, administrators, front-line staff, programs, finance and fundraising presents nonprofit managers with the complex and perfect storm of corporate oversight. Practitioners who hold CNE learn new ways to prioritize capacity-building that ensures they weather the tumultuous seasons of nonprofit administration. Certified Nonprofit Executives become the capacity-building expert CEOs, CFOs, COOs & CDOs a charitable enterprise needs to expand its mission! Many fundraisers come to the nonprofit sector with great intentions to advance a charity’s mission without having correctly answered the question, “who is our customer?” Executives mistakenly think that the rain forest, the student, the homeless or a family-in-need are their customers and therein lies the difficulty. Individuals you serve are not your customers because they have no money. Certified Development Executives are expert at understanding who their true customer is and are equipped with new best practices that ensure they create life-long partnerships with new friends who financially invest in your mission. 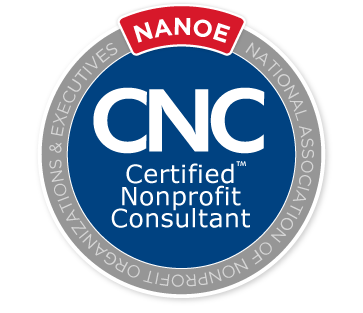 Are recognized by employers in the nonprofit sector as having met a series of standards set by NANOE demonstrating a superior commitment to growing capacity within nonprofits. 2. Have their personal certification officially recorded at the offices of National Association of Nonprofit Organizations & Executives. Receive an official Credentialing Certificate demonstrating their achievement. Receive the credential CNE, CDE, CNC and are authorized to use this designation in their public title. Are provided the CNE, CDE and/or CNC badge for use on business cards, letterhead, websites, etc. Are members in good standing of National Association of Nonprofit Organizations and Executive (NANOE). Pay a one-time fee of $98 for one credential or $148 for two credentials or $198 for three credentials. Avoid cumbersome and expensive recertification processes for CNE, CDE or CNC. Credentials are maintained as long the holder maintains membership in NANOE. Experience the satisfaction and challenge of a meaningful adult continuing educational process that ensures their effectiveness now and in the future. Who gets credentialed by NANOE? the tools they need to generate new revenue. NANOE is the only nationwide membership organization in the U.S. for Executives seeking credentials in the art of nonprofit capacity-building. Practitioners who hold a prestigious NANOE credential are “best practice” experts who grow charitable enterprise and discover new ways to advance the common good. NANOE’s three capacity-building training certifications are based on industry insider knowledge, university research, and a love for serving humanity. Each credential compliments the other ensuring CEOs, CFOs, COOs & CDOs organization-wide are equipped with progressive capacity building practices that drive new growth. Members who maintain their annual NANOE membership maintain their CNE, CDE, or CNC credential with no cumbersome or expensive recertification processes. Select your desired membership level below to get started.